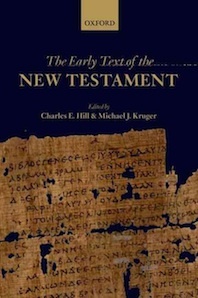 The Eighth Birmingham Colloquium on the Textual Criticism of the New Testament will be held in Birmingham from 4-6 March 2013. The general theme is "The Tradition of the New Testament: Treasures New and Old". Proposals are invited for papers of around 20 minutes. (It may also be possible to accommodate longer presentations.) Suggestions for workshops, presenting work in progress, are also welcome. Titles and short abstracts should be sent to H.A.G. Houghton by the end of December 2012 (all submissions will be acknowledged). A provisional programme and booking form will be made available in early 2013. Brice Jones (The Quaternion) has identified a Galatians (2:2-4, 5-6) manuscript for sale on eBay, here. I am going to make sure we archive the image here in Münster. Thanks, Brice! I have to disagree with Jones, Suciu and Choat on what Brice qualifies as a "likely" dating of the papyrus. Correctly, one could argue that our datable 4th-5th century Coptic codices have documentary qualities such as this, but the inverse assumption is dangerous and factually untenable. In other words, we should not assume that all Coptic codices from later centuries must resemble those high-quality monastic codices of Sohag, Hamuli and Saqqara, and that no later codices were written with documentary qualities. I am hoping that younger scholars will be conservative than previous generations, and will avoid dating Coptic (and Greek) manuscripts to the 4th-5th centuries just because they are ugly and written on papyrus. I would need to examine further samples, but epsilon and kappa have traits here that may reflect Alexandrian majuscule influence -- indicating a likely date later than the 6th century (contra alpha, which is clearly following a Biblical majuscule style). Could this be a writing exercise? Consider the spelling anomalies which Brice mentions, and I note also the spelling ⲧⲉ which has been corrected to ⲇⲉ. The ductus suggests documentary qualities (epsilon's horizontal stroke, position of tau, eta written with one continuous stroke). With regard to the Turkish seller, I have been wondering if this is the source for the Green foundation papyri. This year's SBL/AAR app is available in Appstore for users of iPads, iPhones, or iPods.